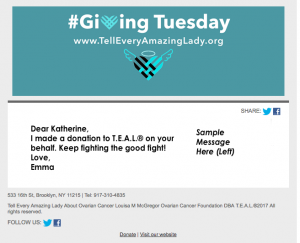 On the eve of this year’s Ovarian Cancer Awareness month, T.E.A.L. and Brooklyn Borough President Eric Adams held a Press Conference on the steps of Brooklyn Borough Hall. 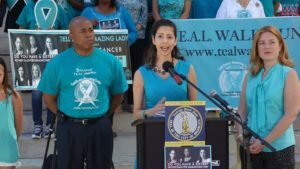 At the Press Conference, T.E.A.L. CEO announced how T.E.A.L. 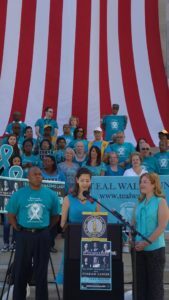 will be lighting Brooklyn Borough Hall the color teal again this year in honor of Ovarian Cancer Awareness Month in addition to the planned activities and events we have scheduled for the month of September. T.E.A.L. board members were present including board member and genetics counselor Flora Poleshchuk who spoke to the press about the rising importance of genetic testing in the prevention of this disease. See the building lit up from September 3rd through September 8th and check our website for other upcoming events throughout the month in other cities like our T.E.A.L. 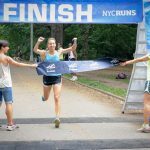 Walk in Woodbury, NY and our newly announced T.E.A.L. Walk in Fairfield, Connecticut taking place in early October. To learn more, visit our website at http://www.kintera.org/eventcentral.